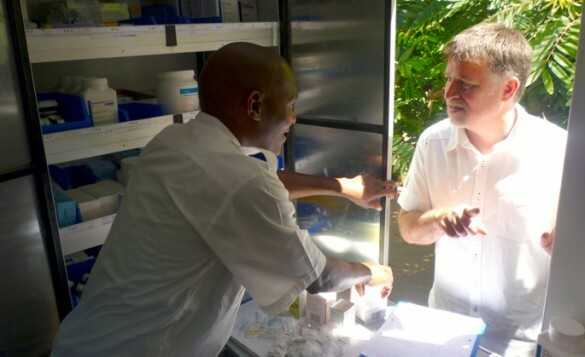 Troy Moon, M.D., MPH, right, talks with a pharmacist in Zambézia Province, where Vanderbilt provides HIV/AIDS-related services and training. Vanderbilt University has received a major federal grant — just more than $7 million in the first year — to extend HIV/AIDS-related technical assistance and training in the rural province of Zambézia, Mozambique. Mozambique has one of the highest rates of HIV infection — about 11.6 percent — in sub-Saharan Africa. An estimated 1.4 million Mozambicans are living with HIV. The five-year grant, entitled “Avante Zambézia” (Portuguese for “Move Forward Zambézia”) was awarded this fall by the Centers for Disease Control and Prevention (CDC). The goal is to provide targeted technical assistance to expand HIV care, treatment and prevention services to more people, while helping the Mozambican Ministry of Health implement high-quality, accessible and sustainable HIV services within a strengthened health system. These services will have “a generational impact” on people in Zambézia and throughout Mozambique, said the grant’s principal investigator (PI), C. William Wester, M.D., MPH, assistant professor of Medicine affiliated with the Vanderbilt Institute for Global Health (VIGH). Avante Zambézia continues the work begun in 2007 under a previous five-year CDC grant, which was also focused on improving HIV/AIDS care and treatment services in Zambézia. Both grants have been funded through the President’s Emergency Plan for AIDS Relief (PEPFAR), established under then-President George W. Bush in 2003. 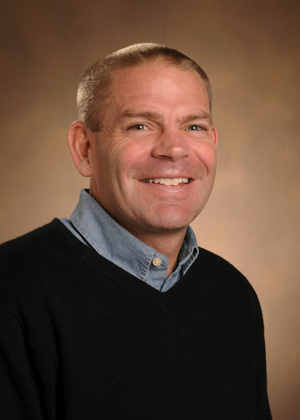 VIGH Director Sten Vermund, M.D., Ph.D., was PI of the previous grant and will continue to provide insights for improving services under the new grant. As in the past, Vanderbilt’s involvement will be coordinated by Friends in Global Health (FGH) LLC, a wholly owned subsidiary of Vanderbilt Health Services (VHS). Troy Moon, M.D., MPH, assistant professor of Pediatrics, is the FGH clinical director. He and his colleagues are supported by a large team of Mozambican health professionals who serve as clinical mentors in approximately 45 health facilities throughout the province. As of May 2012, more than 45,000 persons in the 10 districts in Zambézia receiving support from Vanderbilt and FGH were enrolled in HIV services, and more than 13,000 persons were receiving potentially life-saving combination antiretroviral therapy (cART). The goal for the first year of the new grant is to boost that number to nearly 19,000 persons receiving cART. Besides Moon and Wester, who provides overall technical and managerial leadership for the project, the Vanderbilt/FGH team in Mozambique includes Lara Vaz, Ph.D., research assistant professor of Preventive Medicine and FGH director of Monitoring and Evaluation. Vaz manages a team of capacity-building officers, data analysis officers, data entry specialists and Health Information Systems (HIS) experts to ensure high-quality data for program monitoring and reporting, high-quality program evaluation, and to strengthen local capacity to monitor service delivery. Julie Lankford, FGH Deputy Chief Manager and Country Director in Mozambique, provides overall operational oversight and management for the program. She works closely with Thomas Bonnet, FGH director of Finance and Administration, and Marcia Souza, FGH Provincial Operations Manager. Philip Ciampa, M.D., MPH, instructor in Medicine and Pediatrics, serves as FGH Quality Improvement (QI) Technical Advisor. His goal is to improve clinical operations and health outcomes for HIV-positive women and children in the province. The challenges are great. Zambézia, with 4.2 million people, is Mozambique’s second largest province, has low literacy rates, poor maternal and child health outcomes, high rates of tuberculosis and malaria infections and high levels of malnutrition.